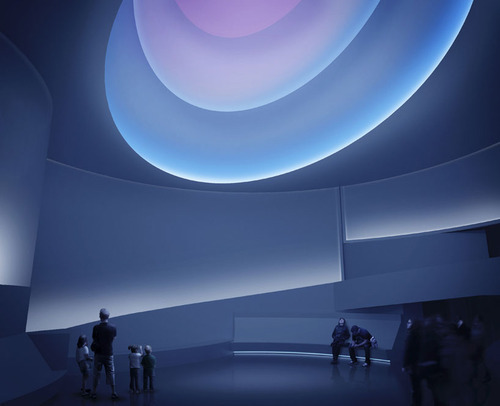 This summer the Guggenheim Museum in New York is showcasing a collection of light installations by James Turrell. The museum’s smaller galleries now host some of his earlier pieces, such as “Afrum I (White)” from 1967 and “Ronin” from 1968. But the main attraction is his site specific piece “Aten Reign,” which has transformed the Guggenheim’s iconic interior. The museum’s rotunda and spiral ramp have been transformed with a series of concentric ovals reaching up towards the musuem’s skylight. 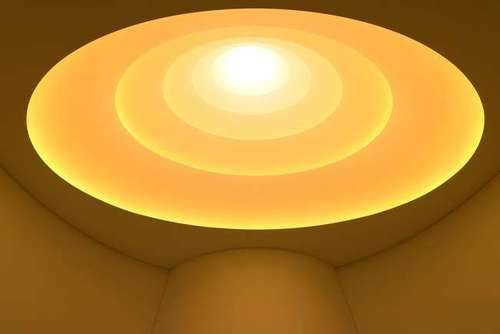 Within each oval there is light shining from LED fixtures that slowly and continually shift in color and intensity. Sitting and viewing the piece through its shifting light one can become entranced as it appears deep and extensive one moment and more flat the next. “Aten Reign” makes you more aware of the act of seeing and reminds you how amazing light can be.